I think it’s pretty well documented that my favorite part of scrapbooking is the journaling. I love using words as much as I love using my supplies. (Actually…dare I confess, just a little bit more!) But that doesn’t mean that the words always come easily for me. You know that feeling when you have something important and true that you want to say, but you can’t quite get there? Or your words feel flat and obvious? I was struggling with that the other day, when I was making a layout about my son Nathan’s basketball experiences. I wrote my journaling…but it felt fairly blah and it didn’t quite say what I wanted. It was mostly cliches and, actually, it didn’t say much of anything. But I kept writing and backspacing and not quite finding the words. So I used a technique that you, too, might want to add to your writing tools: I ignored it. Sometimes—especially when you’re stuck on something—your creative mind needs to work in the background. Even when you’re not consciously thinking about a creative problem you’re encountering, your subconscious mind continues processing. Do a task that isn’t related to the thing you’re stuck on, and you might just find that when you come back, you’ve found the solution. Working past a little block like this means you’ll be writing a second draft of your journaling. I know, that might seem like overkill, spending all that time on journaling, but it’s worth it to dig past your first thoughts into something deeper! Take a nap. Studies have shown that a nap helps invigorate your right brain (the hemisphere more involved with creativity). I almost never need an excuse for a nap, but that’s a pretty good one! Do something creative in a different way. Writing is a different creative process than, say, painting a background, stamping a title, or making an embellishment. Use your body. Go for a run or a walk, clean your kitchen, pull some weeds in your flower beds. This distracts your brain just enough that it can work on the other problem without you really noticing. Get outside! A little fresh air and sunshine might be just the thing you need. Here are my two different drafts, the first one my uninspired and flat one (whenever I start a piece of journaling with the words “It was,” I know I’m in for some writing trouble), the second the one that felt better to me. In between the drafts, I worked on processing some other photos. Just a half hour of ignoring the journaling helped me find the words I needed. What do you do when you’re feeling stuck, journaling-wise? April is here and we're not fooling! We are so very excited that a new month is upon us. This month we are looking forward to Kelly, Lisa, Teacher's Appreciation preparation and Mother's Day preparation. We hope to inspire your spring pages, and help you get ready for the holidays ahead of us. This month we are celebrating shapes: circles, triangles, hexagons, squares, stars. Whether the graphic elements be big or small, our pages love them all. Here is a look at our gallery as a whole! And here are the pages one by one. Please click on over to the gallery to see them bigger, and read the journaling! That's it! We hope you have found a layout or two, or twenty, that will appeal to you and your scrapbooks! 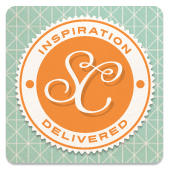 We look forward to seeing your "inspired by" layouts! And please let us know if you like the new cards. A few weeks ago, an old friend of mine came to visit. She moved to North Carolina ten years ago; we’ve kept in touch by email and Facebook and random texts at odd times. When she walked into my office and saw my shelves full of scrapbooks, she said, "Wow. That is a lot of scrapbook layouts." She wasn’t making fun of me—she’s a scrapbooker, too—but her observation made me stop and think of the sheer numbers of layouts we have the chance to create. Every single one is a chance to use lovely supplies and to make something visually appealing. But each layout is also an opportunity to say something significant. Every time we write journaling, we probably write about what happened: we went, we saw, we did. And that is good, of course. What happened is important. But what we feel about what happened—sometimes that is the crux. Of course, some layouts only really need the "what happened" kind of details. But sometimes you want to dig in a little bit more, and that’s what we’re looking at today: journaling that goes deeper than the surface details. Quantity isn’t the issue here. You can write something significant that’s short. It’s the real, memorable bit of something that you’re trying to get at. Here’s an example. Consider this journaling: Today at Grandma’s start-of-summer party, we had an impromptu photo shoot. All the grandkids were there, so it was fun to get everyone in the picture, even if there were a few goofy faces. Looking through the lens at 18 grandkids and 2 grandparents, I couldn't help but really see: the similarities, the differences, the gentle happiness on Grandma and Grandpa’s faces. You might not always get along or see things in the same way, but you are all from the same tribe, and having all these people in your life with the same history? Well, it is a hedge against loneliness. What does this event or experience illustrate about your family, traditions, perspectives, or general way of living? How did the experience change you? Did you learn something about the subject, realize a truth about yourself, or see something in a different way? Can you draw connections between this current moment and something in the past, or between this person and someone else, between a place and a memory, an activity and a personality? What about the experience did you love, or want to always remember? Or, from the opposite perspective, how do you wish it had been different, or what was difficult? What inspired you to take this specific photo? Or what sort of picture do you wish you had about this subject? What did the event or experience cause you to hope, feel, or remember? Is there a color, scent, or flavor of which the experience or event is particularly evocative? How does some characteristic of the subject—age, knowledge, skill, history, habits—change the way he or she experienced the event? Why is this event or experience important? 1. Write about a sport, but not from the perspective of an individual game. 2. Write about a day you loved. 3. Write about a connection between a recent experience and one from your childhood or adolescence. Make sure to share your layouts with us!